My husband got a telescope Christmas and my kids were, of course, immediately smitten with the device and the idea of seeing stars. Despite frigid winter temps and cloudy evenings they spent several nights trying to locate different constellations. On day 3 of this exploration, the tough questions began. What’s a star? What’s the universe? Is something else out there? Why can’t we have ice cream for dinner? 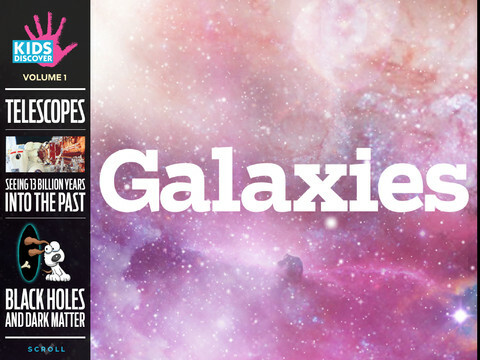 Because my husband and I limit our astral knowledge to daily horoscopes we turned to the app Galaxies by KIDS DISCOVER. It breaks down the fundamentals of galaxies, star-gazing, and constellations, and puts it in language that young readers (or uninformed parents) can understand. If your kiddo is a visual learner, don’t worry: there are oodles of amazing pictures and videos to help reinforce the concepts being taught. Other highlights include American Indian folklore about the night sky and bios of influential people of history who have contributed to astronomy. Our kids are non-readers so we decided to sit down as a family and explore the app together. The grown-ups read aloud and the kids were truly impressed by some of the artist renderings of the Milky Way. 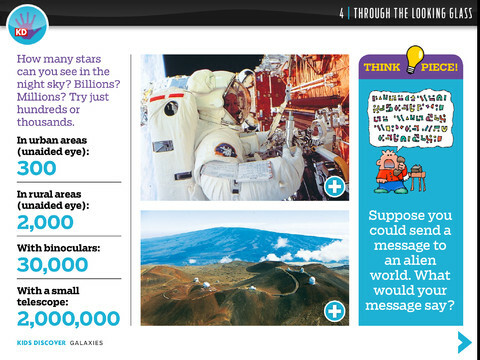 My husband and I actually learned some really interesting facts about the origin of telescopes. Ideally the 6-and-older age group is the target demographic for Galaxies, but my younger kiddos (2 & 5) really had a blast when we helped guide them through it.